First to Write down Prophecy. The Present Form of the Book. Jewish prophet of the eighth century B.C. ; date of birth and death unknown. Among the minor prophets there is none whose personality is so familiar as that of Amos. His name occurs not only in the superscription of the book, but several times (vii. 8, 10 et seq., 14; viii. 2) in the body of it. His home was in Tekoa in Judah, five miles to the south of Bethlehem. The original title of his book was merely "The Words of Amos of Tekoa"; the rest, "who was among the herdsmen," is a later addition emphasizing the fact gleaned from vii. 14, that Amos had been a herdsman before he became a prophet. From the margin this notice appears to have intruded itself into the text. The attempt has been made to discover a northern Tekoa for his home, but there is no need for that. That Amos was from Judah is the simplest interpretation of vii. 13. Amos himself tells us what his profession was: he was a herdsman and one who tended sycamore-figs (vii. 14). At Tekoa sycamores are not grown, but Amos could very well have been the proprietor of a sycamore-grove at some distance from Tekoa, in the Shefelah, the hill country leading down to Philistia, where there were sycamoretreesin "abundance" (I Kings, x. 27). He makes this statement of his occupation to Amaziah, the chief priest of Bethel, who, startled by the ominous utterances of Amos, advises him to make his escape to Judah and there to earn his livelihood by his profession of prophet. Amos denies both premises involved in this rebuke. He does not need to take fees for his prophecies, because he is well-to-do, and he is no prophet either by profession or extraction, but was called by God from behind his flock by special summons. Amos' attitude marks a turning-point in the development of Old Testament prophecy. It is not mere chance that Hosea, Isaiah (ch. vi. ), Jeremiah, Ezekiel, and almost all of the prophets who are more than unknown personages to whom a few prophetical speeches are ascribed, give first of all the story of their special calling. All of them thereby seek to protest against the suspicion that they are professional prophets, because the latter discredited themselves by flattering national vanities and ignoring the misdeeds of prominent men. But Amos marks an epoch in Old Testament prophecy also in another respect. He is the first of the prophets to write down the messages he has received. It is easy to understand the reason for this innovation. He feels himself called to preach in Beth-el, where there was a royal sanctuary (vii. 13), and there to announce the fall of the reigning dynasty and of the northern kingdom. But he is denounced by the head priest Amaziah to King Jeroboam II. (vii. 10 et seq. ), and is advised to leave the kingdom (verses 12 et seq.). Though nothing more is learned than the answer he gave Amaziah (verses 14 et seq. ), there is no reason to doubt that he was actually forced to leave the northern kingdom and to return to his native country. Being thus prevented from bringing his message to an end, and from reaching the ear of those to whom he was sent, he had recourse to writing. If they could not hear his messages, they could read them, and if his contemporaries refused to do so, following generations might still profit by them. No earlier instance of a literary prophet is known, nor is it likely that there was any; but the example he gave was followed by others in an almost unbroken succession. It is true, it can not be proved that Hosea knew the book of Amos, though there is no reason to doubt that he was acquainted with the latter's work and experiences. It is quite certain, on the other hand, that Isaiah knew his book, for he follows and even imitates him in his early speeches (compare Amos, v. 21-24, iv. 6 et seq., v. 18 with Isa. i. 11-15; Amos, iv. 7 et seq. with Isa., etc., ix. 7 et seq., ii. 12). Cheyne concludes with great probability that Amos wrote the record of his prophetical work at Jerusalem, after his expulsion from the northern kingdom, and that he committed it to a circle of faithful followers of YHWH residing there. Amos is undoubtedly one of the grandest personalities among the Old Testament prophets; indeed, the most imposing of all, if the fact be considered that he is the first of the writing-prophets. His lofty conception of Deity, his uncompromisingly moral conception of the order of the universe, and his superiority to all religious narrowness, are admirable indeed. Leaving the above-mentioned "doxologies" aside, YHWH is in vii. 4, ix. 2 the Ruler of the universe, and in i., ii., and ix. 7 He is the Lord of all other nations as well as of Israel. The standard by which He measures peoples is morality, and morality only. It is by His inscrutable will that Israel was chosen among the peoples, but as a result it follows that God is doubly strict in His demands upon this nation, and doubly severe in His punishment of its transgressions (iii. 2). Ritualistic zeal and the richest burnt-offerings avail nothing in extenuation; such acts are contemptuous in the sight of YHWH, who may be served without any religious ceremonies, but not without morality (iii. 21-25, iv. 4, 5, 13). Therefore let the nation not comfort itself with the hope of the "Day of YHWH," which will be a day of terror for Israel, and not of salvation (v. 18-20). It is all over with Israel; the complete destruction is at hand (see especially ii. 5, v. 1 et seq., ix. 1-4). Distinct as are these fundamental principles of his discourses, Amos must by no means be considered as an uncompromising prophet of evil; it should not be forgotten that Israel's destruction is brought about by its sinfulness, and it is only because experience appears to show an unwillingness to repent, that the hope of forgiveness is cut off. Should this experience prove false and Israel actually repent, forgiveness and national life would be by no means hopeless; and therefore utterances like v. 4 and 14, however inconspicuous they may be in comparison with the denunciatory passages, are by no means to be overlooked, and certainly not to be held as spurious. It is certain, however, that Amos did not shrink from facing the possibility of the utter destruction of Israel. Amos has always been admired for the purity of his language, his beauty of diction, and his poetic art. In all these respects he is Isaiah's spiritual progenitor. There is no need for astonishment that a rustic should have been capable of such diction. The period of the prophet's activity is the reign of Jeroboam II., king of Israel, whose dynasty he mentions in one of his prophecies (vii. 9), while the narrator of vii. 10, etc. (probably not identical with Amos), clearly states that Jeroboam was reigning at the time when Amos preached at Beth-el. The superscription of the book (i. 1) mentions Uzziah, king of Judah, before Jeroboam, which is doubtless correct, inasmuch as Uzziah was a contemporary of Jeroboam; but the statement is at the same time puzzling, since it is not known that Amos was ever active in Judah. The superscription adds that he "saw" his words two years before the earthquake. Now Amos doubtless experienced an earthquake (iv. 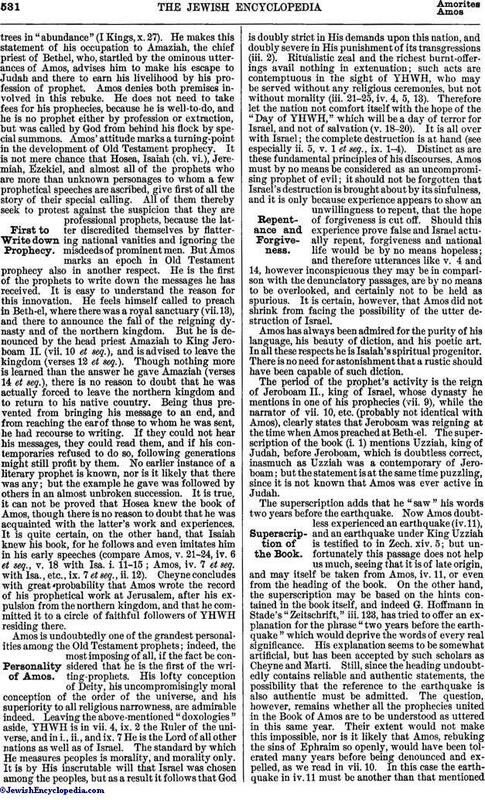 11), and an earthquake under King Uzziah is testified to in Zech. xiv. 5; but unfortunately this passage does not help us much, seeing that it is of late origin, and may itself be taken from Amos, iv. 11, or even from the heading of the book. On the other hand, the superscription may be based on the hints contained in the book itself, and indeed G. Hoffmann in Stade's "Zeitschrift," iii. 123, has tried to offer an explanation for the phrase "two years before the earthquake" which would deprive the words of every real significance. His explanation seems to be somewhat artificial, but has been accepted by such scholars as Cheyne and Marti. Still, since the heading undoubtedly contains reliable and authentic statements, the possibility that the reference to the earthquake is also authentic must be admitted. The question, however, remains whether all the prophecies united in the Book of Amos are to be understood as uttered in this same year. Their extent would not make this impossible, nor is it likely that Amos, rebuking the sins of Ephraim so openly, would have been tolerated many years before being denounced and expelled, as we read in vii. 10. In this case the earthquake in iv. 11 must be another than that mentionedin i. 1, because it could not be referred to two years before it actually happened. Moreover, it is unlikely that Amos should not have added new prophecies to those spoken during his stay in the northern kingdom, when he once proceeded to write down his utterances (compare Jer. xxxvi. 32). If i. 1 be admitted as authentic, the most probable conclusion is that "two years before the earthquake" was originally the date for only a part of the book, perhaps for only the introductory speech in i. 2. The reign of Jeroboam II. lasted forty-one years, according to II Kings, xiv. 23. Though it can not be fixed with certainty, this much may be said, that its termination must be placed between 750 and 740 B.C. Marti ("Ency. Bibl." article. "Chronology," p. 797) fixes his reign between 782 and 743 B.C. The activity of Amos could hardly have coincided with the close of his reign. The fact alone that Isaiah's call can not have happened later than 740, while he so evidently draws on Amos' prophecies, is sufficient ground for placing Amos not later than 750. 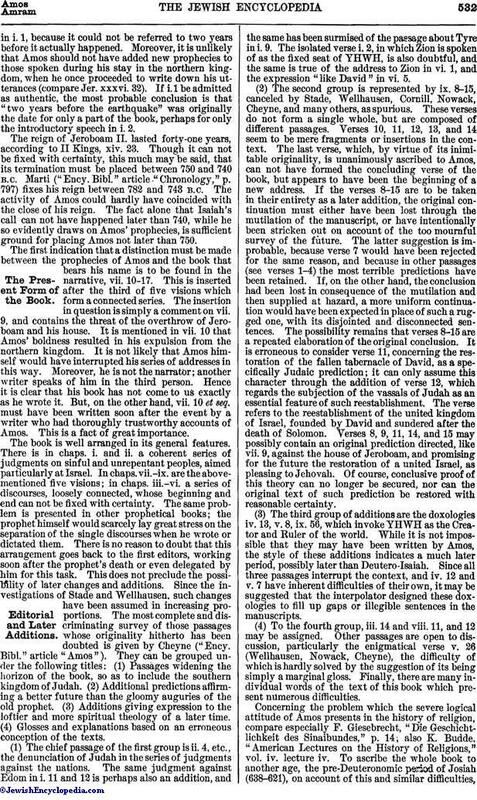 The first indication that a distinction must be made between the prophecies of Amos and the book that bears his name is to be found in the narrative, vii. 10-17. This is inserted after the third of five visions which form a connected series. The insertion in question is simply a comment on vii. 9, and contains the threat of the overthrow of Jeroboam and his house. It is mentioned in vii. 10 that Amos' boldness resulted in his expulsion from the northern kingdom. It is not likely that Amos himself would have interrupted his series of addresses in this way. Moreover, he is not the narrator; another writer speaks of him in the third person. Hence it is clear that his book has not come to us exactly as he wrote it. But, on the other hand, vii. 10 et seq. must have been written soon after the event by a writer who had thoroughly trustworthy accounts of Amos. This is a fact of great importance. The book is well arranged in its general features. There is in chaps. i. and ii. a coherent series of judgments on sinful and unrepentant peoples, aimed particularly at Israel. In chaps. vii.-ix. are the above-mentioned five visions; in chaps. iii.-vi. a series of discourses, loosely connected, whose beginning and end can not be fixed with certainty. The same problem is presented in other prophetical books; the prophet himself would scarcely lay great stress on the separation of the single discourses when he wrote or dictated them. There is no reason to doubt that this arrangement goes back to the first editors, working soon after the prophet's death or even delegated by him for this task. This does not preclude the possibility of later changes and additions. Since the investigations of Stade and Wellhausen, such changes have been assumed in increasing proportions. The most complete and discriminating survey of those passages whose originality hitherto has been doubted is given by Cheyne ("Ency. Bibl." article "Amos"). They can be grouped under the following titles: (1) Passages widening the horizon of the book, so as to include the southern kingdom of Judah. (2) Additional predictions affirming a better future than the gloomy auguries of the old prophet. (3) Additions giving expression to the loftier and more spiritual theology of a later time. (4) Glosses and explanations based on an erroneous conception of the texts. (1) The chief passage of the first group is ii. 4, etc., the denunciation of Judah in the series of judgments against the nations. The same judgment against Edom in i. 11 and 12 is perhaps also an addition, and the same has been surmised of the passage about Tyre in i. 9. The isolated verse i. 2, in which Zion is spoken of as the fixed seat of YHWH, is also doubtful, and the same is true of the address to Zion in vi. 1, and the expression "like David" in vi. 5. (2) The second group is represented by ix. 8-15, canceled by Stade, Wellhausen, Cornill, Nowack, Cheyne, and many others, as spurious. These verses do not form a single whole, but are composed of different passages. Verses 10, 11, 12, 13, and 14 seem to be mere fragments or insertions in the context. The last verse, which, by virtue of its inimitable originality, is unanimously ascribed to Amos, can not have formed the concluding verse of the book, but appears to have been the beginning of a new address. If the verses 8-15 are to be taken in their entirety as a later addition, the original continuation must either have been lost through the mutilation of the manuscript, or have intentionally been stricken out on account of the too mournful survey of the future. The latter suggestion is improbable, because verse 7 would have been rejected for the same reason, and because in other passages (see verses 1-4) the most terrible predictions have been retained. If, on the other hand, the conclusion had been lost in consequence of the mutilation and then supplied at hazard, a more uniform continuation would have been expected in place of such a rugged one, with its disjointed and disconnected sentences. The possibility remains that verses 8-15 are a repeated elaboration of the original conclusion. It is erroneous to consider verse 11, concerning the restoration of the fallen tabernacle of David, as a specifically Judaic prediction; it can only assume this character through the addition of verse 12, which regards the subjection of the vassals of Judah as an essential feature of such reestablishment. The verse refers to the reestablishment of the united kingdom of Israel, founded by David and sundered after the death of Solomon. Verses 8, 9, 11, 14, and 15 may possibly contain an original prediction directed, like vii. 9, against the house of Jeroboam, and promising for the future the restoration of a united Israel, as pleasing to Jehovah. Of course, conclusive proof of this theory can no longer be secured, nor can the original text of such prediction be restored with reasonable certainty. (3) The third group of additions are the doxologies iv. 13, v. 8, ix. 56, which invoke YHWH as the Creator and Ruler of the world. 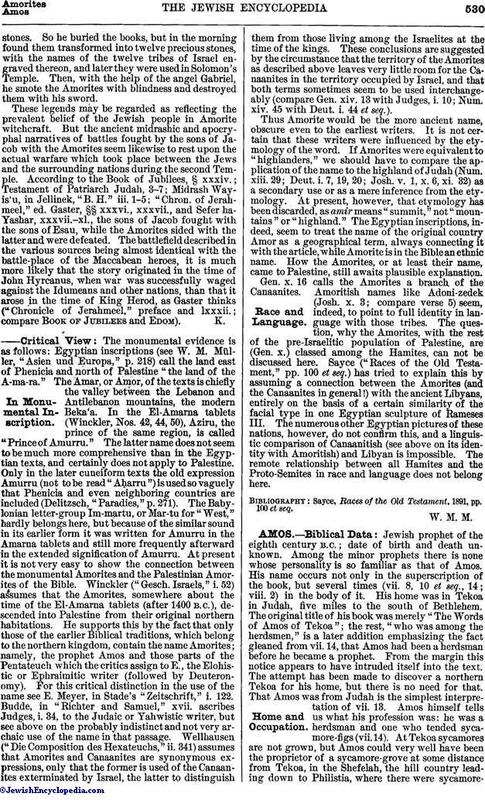 While it is not impossible that they may have been written by Amos, the style of these additions indicates a much later period, possibly later than Deutero-Isaiah. Since all three passages interrupt the context, and iv. 12 and v. 7 have inherent difficulties of their own, it may be suggested that the interpolator designed these doxologies to fill up gaps or illegible sentences in the manuscripts. (4) To the fourth group, iii. 14 and viii. 11, and 12 may be assigned. Other passages are open to discussion, particularly the enigmatical verse v. 26 (Wellhausen, Nowack, Cheyne), the difficulty of which is hardly solved by the suggestion of its being simply a marginal gloss. Finally, there are many individual words of the text of this book which present numerous difficulties. Concerning the problem which the severe logical attitude of Amos presents in the history of religion, compare especially F. Giesebrecht, "Die Geschichtlichkeit des Sinaibundes," p. 14; also K. Budde, "American Lectures on the History of Religions," vol. iv. lecture iv. To ascribe the whole book to another age, the pre-Deuteronomic period of Josiah (638-621), on account of this and similar difficulties,as H. J. Elhorst, "De Profetie van Amos" (Leyden, 1900), proposes, is entirely unwarranted and impossible. See the criticism of P. Volz in Schürer's "Theol. Literatur-zeitung," May 12, 1900. Heilprin, Historical Poetry of the Ancient Hebrews, 1882, ii. According to the rabbis (Lev. R. x., Eccl. R. i. 1) Amos was nick-named "the stutterer" by a popular etymology. The people, on hearing his bitter rebukes, retorted: "Has the Lord cast aside all His creatures to let His spirit dwell only on this stutterer?" Six hundred and thirteen commandments were given to Moses; King David reduced them to eleven (Ps. xv. ); Isaiah to six (Isa. xxxiii. 15); Micah to three (Micah vi. 8); Isaiah, a second time, to two (Isa. lvi. 1); but Amos to one: "Seek Me and Live!" (Mak. 24a). According to rabbinical tradition (Suk. 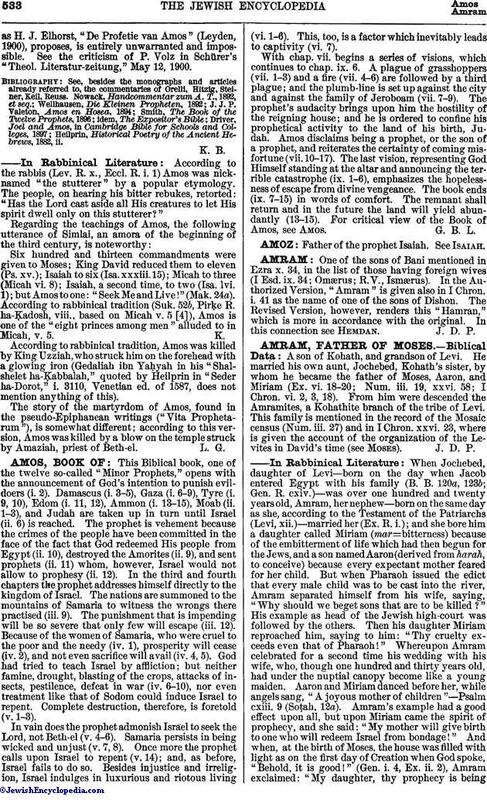 52b, Pirḳe R. ha-Ḳadosh, viii., based on Micah v. 5 ), Amos is one of the "eight princes among men" alluded to in Micah, v. 5. According to rabbinical tradition, Amos was killed by King Uzziah, who struck him on the forehead with a glowing iron (Gedaliah ibn YaḦyah in his "Shalshelet ha-Ḳabbalah," quoted by Heilprin in "Seder ha-Dorot," i. 3110, Venetian ed. of 1587, does not mention anything of this). The story of the martyrdom of Amos, found in the pseudo-Epiphanean writings ("Vita Prophetarum"), is somewhat different; according to this version, Amos was killed by a blow on the temple struck by Amaziah, priest of Beth-el.